Sale Ends Easter Sunday! Code: 'FB10' $10.00 off! Order before 3:00 EST and with FREE shipping expect your package to arrive on Thursday April 25th. Want it faster? Upgrade to Overnight and your package is guaranteed on Tuesday April 23rd. Our very unique Devin tungsten ring is highly polished with a center groove in the middle. This design is subtle but with a bold look as well. Imagine wearing a ring that never needs polishing, a ring that is virtually scratch proof. Tungsten rings are the future and your looking a one of the best styles out there! Features: High scratch-resistant tungsten, four times harder than titanium. 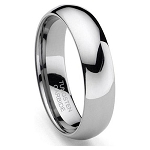 This tungsten ring is comfort fit contoured on the inner surface for a more comfortable fit. Completely hypoallergenic, our tungsten carbide rings will never turn your finger green or cause irritation to your skin. If you need a durable yet elegant ring, this is for you! Included 100% Money Back Guarantee! Also comes with a black velvet stylish ring box and FREE SHIPPING! Amazing ring, love this style and the super fast shipping! Thank you! 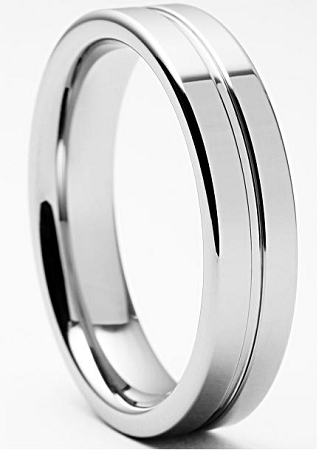 We love the sleek, simple and clean design of the Devin Tungsten Ring. Great customer service and super fast shipping. I'm glad to find Tungsten Fashion online. I was impressed by their genuine services with fast shipping, helpful staff, and reliable business! The ring is shiny and high quality. I definitely recommend you to use Tungsten Fashion products and service. I am happy with Shipping Speed. I would recommend this item if anyone planning to buy Tungsten carbide Ring. Bought the ring and it was a bit tight. Seller exchange for new size and was very prompt. only down side to this is that they do not have quarter sizes. Unfortunately, The 6 is too tight and the 6.5 is a bit loose. Wish they had quarter sizes. Overall, this is great quality rings and affordable pricing. Simple, clean design and very easy to wear. I would recommend both the ring and this company. The ring was a great value and fits perfect... an easy transaction and fast shipping, what more could you ask for. The ring is classically simple. If you are looking for a ring that is beautiful and masculine, this is the one. I find the quality to be first rate. This company went out of their way to be sure that my new ring fit and that I was satisfied. Simple, classic and great price. It was delivered in a timely manner in a nice felt ring box. Fits my left ring finger perfectly! Great price! Looks great too! Q: Does this ring have a 'Tungsten Carbide' stamp inside the ring? A: Yes, this ring does have the 'Tungsten Carbide' stamp on the inside of the ring. Q: Is that a groove in the ring? A: Yes, that is a rounded groove that goes inward. I hope this helps.